With this newsletter we debut two blended wines that were inspired by the great wines from the southern Rhone valley of France. This white, a synergistic blend of 80% Roussanne, 10% Viognier, and 10% Chardonnay is even better than its individual parts. The Roussanne from Stolpman vineyard, which was crop thinned to two tons to the acre, was unctuous, apricot-y and heavy with a bee’s wax and honey character. 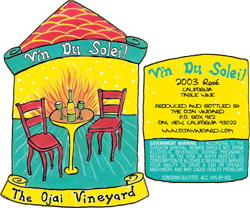 Classic, and definitely very interesting, it benefited from the aromatic lightness and floweriness of Viognier from Roll Ranch, which in 1999 was particularly pungent at one half ton per acre. The Chardonnay (from Bien Nacido Vineyard), while unusual in southern Rhones (although it was said to be used in Rayas blanc in the ’60’s) gives the wine needed acidity and leesy fatness at the same time. Long, rich and satisfying, this wine works!